Last year, I took a completely impromptu trip to India with my friend Adam. We travelled through Delhi, Varanasi, and Rajasthan for two weeks, taking notes every night even though we were beat. Instead of telling you about our trip in retrospect, here are some of our notes. The magic is in the details. I survived my first day in Varanasi, but not without smashing my ear into the side of a rickshaw and getting pooped on by a pigeon. We rode the rickshaw through crazy traffic and I’ve never seen Adam so scared. I went to the biggest mosque in India in Delhi this morning, where I had to wear a gigantic floral robe because I showed up inappropriately dressed. Then we flew to Varanasi and did a half day tour of the maze of buildings along the riverside and drank chai by the open air cremations. Lots of dead bodies wrapped in beautiful fabrics were carried by us while we sat in a lassi cafe. I had fresh guava lassi! So good. Then I had my first street food! Crispy potato chaat. Adam has determined that I have a stomach of steel. His is going through all sorts of weird things. Even hotel food is amazing here. We ended the day watching the religious ceremonies they perform nightly on the river with music, chanting, candles, and fire. I started to doze off though. Going to sleep now, have to wake up at 5:00am for a sunrise boat ride. Our tour guide is awesome. He is Indian but his name is Rahul Christopher… He said it’s Italian… And he claims to have many European ex girlfriends. Also he thought I was 15 or 16. 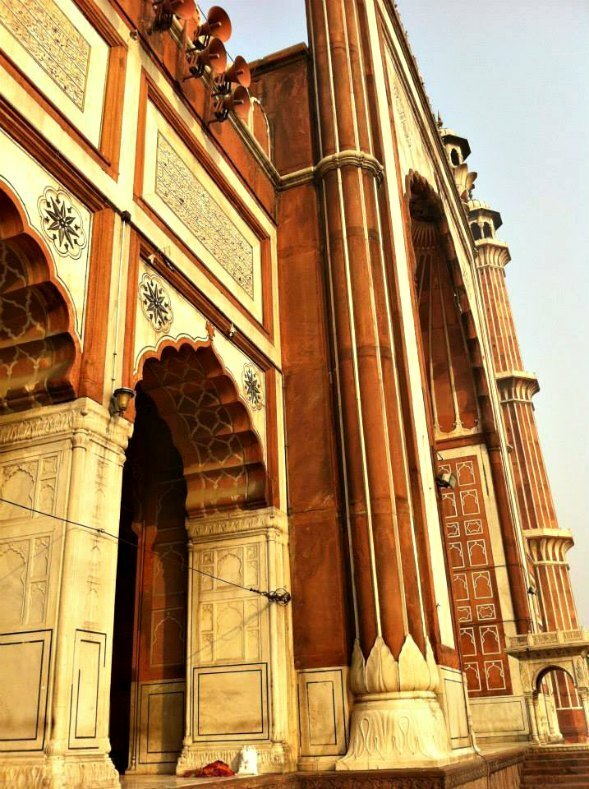 Above is Jama Masjid, a peaceful mosque amidst the craziness that is Delhi. 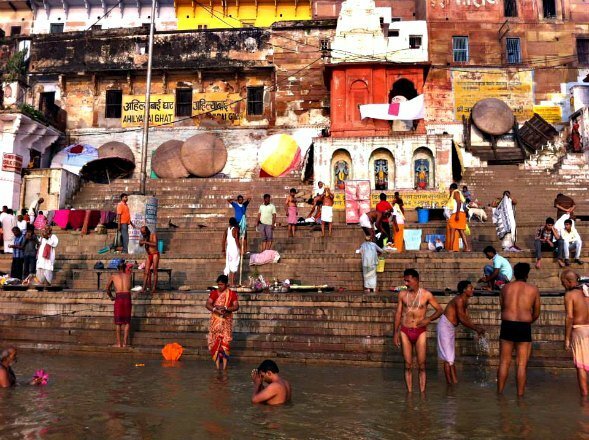 Below is the morning bathing and prayer ritual along the ghats of the holy Ganges river in Vanarasi. It wasn’t mango season when we were in India in October, so I ended up having a lot of banana lassis and papaya shakes. Blue Lassi Shop is famous in Varanasi. In a tiny room with two wooden benches, the owners make the curd (yogurt) fresh and serve it with fruit, chocolate shavings, honey, and pomegranate seeds in clay bowls. You eat the lassi with a wooden spoon. It’s creamy and not too sugary. 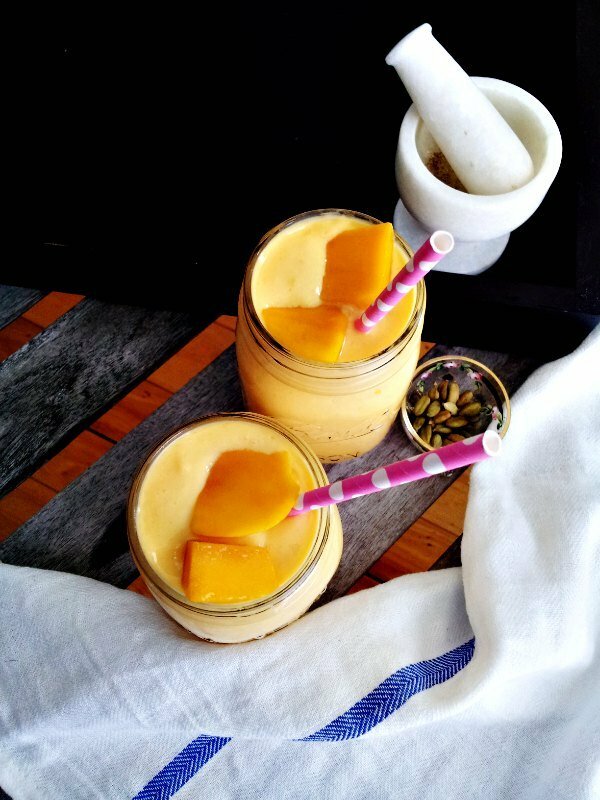 A lot of mango lassi recipes here are watered down with milk. If you want a more drinkable lassi, add 1/4 to 1/2 cup milk to my recipe, but I prefer it thick and tangy. It’s perfect to drink through a straw or eat with a spoon. Peel and cut your mangoes, removing the seed. You should have at least 3 cups of mango chunks. Save a few pieces for garnish. 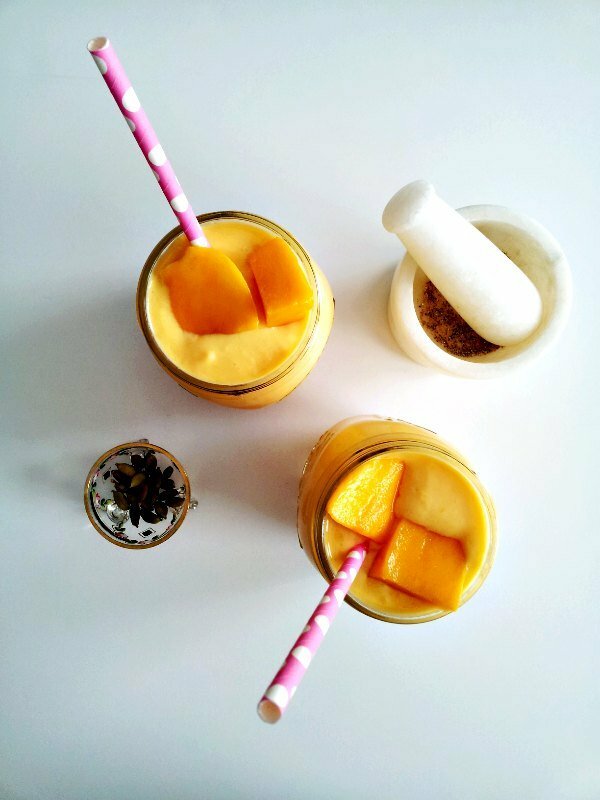 Blend the mango chunks and yogurt until smooth and pureed, then taste for consistency and sweetness. Add milk 1/4 cup at a time if you prefer a thinner lassi. You'll definitely want to add milk if you only have Greek yogurt on hand. 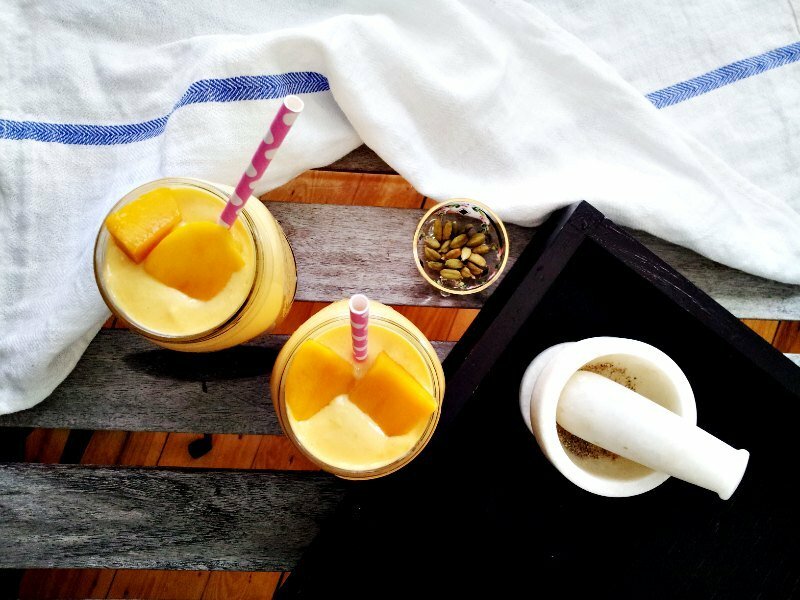 Depending on the ripeness of your mangos, you may want to add a couple tablespoons of honey to sweeten your lassi. If using, remove cardamom seeds from their shells and pound into a fine powder using a mortar and pestle, then stir into the lassis. I highly recommend adding cardamom. It makes the mango lassi even more refreshing. 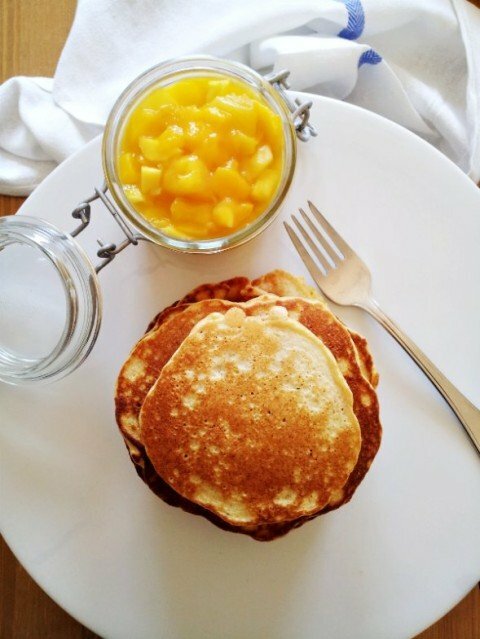 You might also like these mango pancakes.